A portable version of the awarded level editor that allows the players to create custom levels for the games from the Super Mario Bros. series. 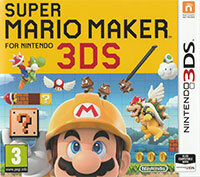 Super Mario Maker 3DS for 3DS is an easy to use editor that enables the player to create his own levels for games from the Super Mario Bros. series. The title is a modified version of the original game that was released in 2015 on Wii U console. The original game was well received by the players and the critics and it was nominated to many game of the year awards. During the game the player builds two-dimensional platform levels from bricks that are typical for classic games from Super Mario Bros. series. The creation process is very intuitive and it utilizes the function of the touch screen of 3DS. Thanks to the clear interface, it is very easy to select and place pieces of scenery, like bricks, pipes and enemies, in specific positions. The effects can be immediately tested and improved if need be. Around one hundred exemplary levels were created by the developers. In addition to that, it is possible to download from the Internet levels created for Wii U version that were selected by developers. In difference to Super Mario Maker for Wii U, the portable version doesn’t offer online features that would allow sharing the created levels through Internet. This function was limited to Street Pass contacts and to local connection between two consoles. What’s a novelty related to this option is the possibility to send an unfinished level, allowing friends to construct new levels together. The application offers two graphics styles – the original one from 8-bit Super Mario Bros. and the HD style from the New Super Mario Bros. U. The title also supports amiibo figures that unlock new skins for the protagonist. Expectations: 8.8 / 10 calculated out of 5 players' votes.